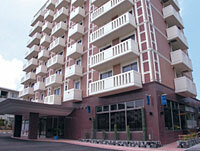 Hotel Southerncoast Miyakojima is adjacent to Painagama beach (one minute walk). It is an easy access to Hirara Port and downtown. Rooms are equipped with free internet connection, and two PC at the lobby floor has is available freely at any time. 10 minutes walk from Hirara port. 10 minutes by Taxi from Miyako Airport.